Dion Fortune was a 20th century spiritual teacher and Avalonian mystic. Her early spiritual training was within the Theosophical society and when she was 26 she had a dream which would direct much of her later work. She found herself travelling along a long passageway with many doors opening off it. At the end of the passage she found herself in the Theosophical reading room in Tavistock Square London. The room was filled with sunlight and then the room opened out and she found herself transported to a high plateau in the Himalayas where she knelt before 2 vast beings:- one in a purple robe who was the embodiment of compassion, The Most Holy, and one in an indigo blue robe who embodied deep understanding, The Most Wise. In her dream she was returned to the library knowing she had been accepted as a pupil by the Most Holy. This dream led to her studying firstly with a teacher with the remarkable name of Theodore Moriarty who taught her the basics of occultism and esoteric freemasonry and then becoming initiated into Alpha et Omega Temple of the Hermetic Order of the Golden Dawn. Here she learned the basics of the Qabalah and worked with a mentor called Maiya Curtis Webb who taught her to act as a link between the inner and outer worlds. 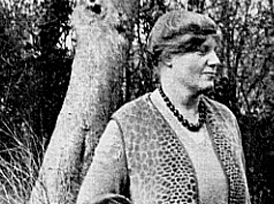 Early in her life she developed a strong interest in Glastonbury and Avalon and in 1921 we find her acting as a medium for Frederick Bligh Bond having a vision of a circular wattle church which she felt was established by Joseph of Arimathea. The question of Avalon and the mysteries of the Graal would occupy her for the rest of her life. Her 1934 book ‘Avalon of the Heart’ is a beautiful evocative prose poem, a masterpiece of spiritual writing that evokes the heart of Britain. In 1927 she left the Order of the Golden Dawn and established her own occult fraternity, The Community of the Inner light later called the Society of the Inner Light, an organization which still exists today. She brought to occult study an understanding of psychology and formulated a method of teaching in which students learned to bring together the Green Ray of Power, the Orange Ray of Wisdom and the Purple Ray of Devotion in the service of the Inner Light. Through these rays she sought to integrate the earth-centred pagan traditions with the clarity of the Hermetic Wisdom and place both at the service of the light of the Mystic Christ. She wrote a whole series of important occult works notably the Mystical Qabalah which made this ancient system relevant and available to 20th century seekers. Not content with a theoretical exposition she wrote a remarkable series of occult novels which showed how occult work could create growth and healing and gave an understanding of the motivation and practices of occult initiates. In 1924 the Fraternity of the Inner Light bought some land at the foot of Glastonbury Tor and increasingly her inner life and work focused on the mysteries of Avalon. Here she focused on the Arthurian Legends and the Quest of the Grail, the mystical Christianity and Glastonbury as the root of Celtic Christianity and the elemental energies of the earth itself. This culminated in her work during the war years in which she took the hitherto hidden methods of working in occult fraternities and adapted them so that they could be worked by anyone with the time and inclination to bring the capacities of Love Power and Wisdom from the inner worlds into outer expression. She wrote a series of letters teaching these methods which were sent to anyone who wished to engage in the work. The meditation method centred on Glastonbury Tor and the image of the Tree of Life and the images of the Arthurian myths. Working with these forms as theophanic prayer and focused mind-power brought life and light into those working with the meditation and into the collective soul. This experiential way of working was the foundation of her life and work which she continued to teach to others in many different ways as a disciple of the ‘Most Holy’. She died in 1946 of acute Leukemia but her work has continued through her Fraternity and those generations of occultists who continue to study and practice her methods.